Above: Polished slab of Rhynie chert showing very well preserved vertical axes of Rhynia gwynne-vaughanii, set in horizontally bedded chert. The early land plants found as fossils in the Rhynie chert are locally preserved in such exquisite detail that cellular details can be examined. This has allowed detailed anatomical studies to be performed on the Rhynie plants. The plants are relatively simple in their level of organisation and include seven identified 'higher land plants', two enigmatic nematophytes and a number of other plants including various types of fungi, algae and the earliest fossil lichen. Cuticle with cutan that helps preserve moisture. Stomata for gaseous exchange with the atmosphere. Intercellular air space network for gas diffusion. A vascular strand with lignin for water conduction and support. Sporangia with a well developed dehiscence ('splitting') system to release spores. The taxonomy of the Rhynie plants poses difficulties for subdivision into currently accepted taxonomic groups. For the purposes of this resource, we have made a simple subdivision into the 'higher land plants' - those with the features listed above, and 'other non-vascular plants' from the chert. The seven higher land plants of the Rhynie chert 'macroflora' that have been described to date are detailed below. Various life stages have also been described for a number of the plants with both the sporophyte and gametophyte stages having been identified (e.g. : Remy & Hass 1986, 1991a,b,c,d; Remy & Remy 1980a,b; Remy et al. 1993 and Kerp et al. in press). A number of these plants exhibit other delicate features such as mycorrhizae, bacterial infections and various forms of pathological damage. Five of the plants are true vascular plants or tracheophytes, showing tracheids in the water-conducting cells. Two plants, Aglaophyton and Nothia do not show tracheids and can therefore not be considered as tracheophytes. Click on the hyperlinks below for a basic overview of the plants and the following individual plant names for a more detailed description of their morphologies. 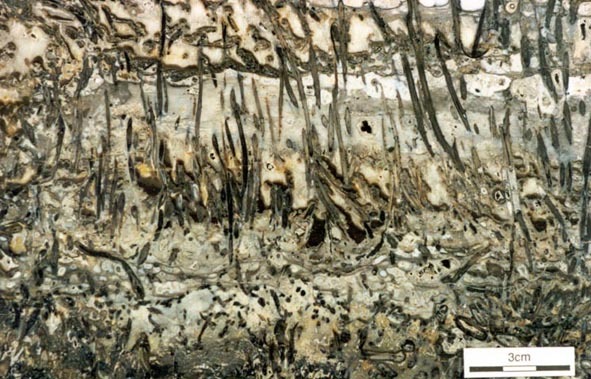 Apart from the fossil plants in their own right, fossilised spores are also found, not only in the chert but also in the associated sediments, particularly the shales and mudstones. Many species have been identified and described and have been useful for biostratigraphic purposes in dating the sediments (see section on Age of the Rhynie Chert). There remains, however, a degree of uncertainty as to which of the vascular plants each belongs, and there may well be spores present from other plants that have not yet been found preserved in the cherts. Click here to learn more. The described flora of the Rhynie chert also includes non-vascular plants such as nematophytes, algae, fungi and a lichen. Click on the following hyperlinks for a more detailed description of the other forms of plant fossils in the Rhynie chert:.